Two explosions from heavy weapons echoed from the eastern shore of Lake Upemba across the glassy waters to a tiny island formed from dead reeds. Displaced families were huddled there, under a makeshift shelter that was slowly sinking into the sludge. "From the sound of it, the army is pushing the Mayi-Mayi out of our villages," said Kulu Ngwande Abraham, an agronomist who fled his village by canoe with his wife and three children in mid-January. "We could soon be going back," he added. His wife, however, disagreed. "What happens when the army leaves and the Mayi-Mayi return?" she said. "We'll be worse off than we were." This remote wilderness of shallow lakes, marshes and quagmires near the source of the Congo River has become Katanga's newest battleground, as some 4,000 troops from the post-war army of the Democratic Republic of Congo (DRC) - many with little or no training - chase cat-and-mouse-style the even less disciplined Mayi-Mayi rebels across the vast expanses of the north and centre of the province. In the process, tens of thousands of civilians are being displaced, though nobody really knows exactly how many. 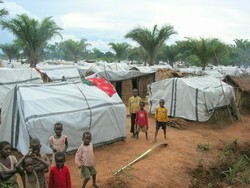 Médecins Sans Frontièrs (MSF) provides assistance to displaced people in more locations in Katanga than any other organisation. The medical charity said it knew of 92,000 people that were displaced in the last year, but many more may be hiding in the bush, terrified that the Mayi-Mayi would get them. 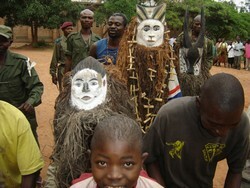 The Mayi-Mayi wear masks and talismans and claim to have magical powers that stop bullets from penetrating their bodies. If not for their AK-47s, they might resemble ancient African warriors. The so-called "Mayi-Mayi phenomena" in Katanga, however, is actually recent. The groups formed in 1998, when President Laurent Kabila created armed civil defence forces in Katanga to stop Rwandan military from invading. After the Rwandans left, the Mayi-Mayi quickly devolved into an anarchic assortment of pro- and anti-government groups. When Joseph Kabila became president in 2001, he lost control of them completely. For the last year or so, many Mayi-Mayi groups in Katanga have rallied around a leader named Kyungu Mutanga, alias Gedeon. Under his command, villages have been systematically pillaged then burned. There are countless reports of atrocities. Yet, until there is a definitive human rights investigation into Gedeon's abuses, separating myth from reality will remain difficult. All the displaced people interviewed, as well as government soldiers and Mayi-Mayi fighters, said that what terrifies them about Gedeon are stories that he and his men are cannibals. However, none of them - even the Mayi-Mayi - said they had witnessed acts of cannibalism. Neither had they ever met anyone who witnessed them. Still, they all said they believe the stories. Many abandon their villages because of a rumour that he and his men were coming. Gedeon clearly rules though terror. According to a statement MSF issued in January, "Whatever may have happened in the Mayi-Mayi controlled zones, there is a real sense of fear among the IDPs [internally displaced persons]." 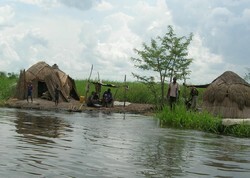 Gedeon did not arrive at Lake Upemba until late January. His base had been 200 km east, in a 10,000 sq km forested area that forms a perfect triangle between the towns of Mitwaba, Pweto and Manono. The government had called on the army to retake the triangle and Gen Jean Claude Tshibumbu was assigned five battalions from the DRC’s 6th military region to do the job. The operation began in November 2005. Gen Tshibumbu's command centre is Dubie, a town of mud huts on the southern perimeter of the triangle. When IRIN met him in late January at his office in a dusty little room loaned to him by the local Catholic priest, it was hard to believe he was commanding 4,000 troops to war. Tshibumbu was jolly and cavalier, bragging about his days as a rebel Katanga Tiger in the 1960s, fighting - unsuccessfully - for Katangan independence; and then in the late 1990s, fighting to help overthrow former President Mobutu Sese Seko. "Gedeon is not a big problem," he said. "This operation will be over by February." When asked how that would happen, he said with a swagger, "Gedeon is just a bandit, but I am the original bandit." From all reports, the fighting in the triangle has been fairly low-key. A friendly young Mayi-Mayi commander who recently surrendered to the army at Dubie, has been left to walk around freely. "They treat me well," he said. "Now I am on their side." Soldiers and Mayi-Mayi fighters in Dubie said that battles typically consist of firing off a couple of bullets and maybe a grenade, until the other side runs away. Casualties are rare. The problem for civilians is that the winner gets to loot the nearby village, "taking everything from food to door knobs," MSF said. If the Mayi-Mayi happen to be the winners, the village is also burned, causing all the inhabitants to flee. If the army prevails, the inhabitants must flee as well: The army tells them they must leave for their own safety. When the campaign began in November, many displaced people slept in the bush around their villages. Then in December, the seasonal rains started and tens of thousands slowly walked, often more than 100 km, to towns on the perimeter of the triangle. Each day, bedraggled pregnant women, children and elderly trickled in. They are now crowded together in vast camps around the towns. Assistance from relief agencies has been slow, with many people still in need of food, clothing and medical attention. At Dubie, around 18,000 people have arrived so far, doubling the town's original population. The town’s small MSF health clinic suddenly had to bring in thousands of emergency rations and sheets of plastic to be used for shelter. The Catholic priest in Dubie called for assistance from the Catholic charity Caritas, which delivered clothing and other non-food items. The biggest problem, however, has been food. In early December the World Food Programme allocated maize and beans to Dubie and other towns with displaced populations, but bad roads and heavy rains delayed delivery. People did not start receiving their first rations until early January, and they already need more. In early February, government officials started telling those camped on the perimeters of the triangle, that they must return to their homes as Gedeon and his men had fled the area. Relief workers said they had not yet ventured into most of the triangle to verify that it was safe. They said that even if the villages were secure, it would not be a good idea to send people back too quickly. Their villages have been destroyed and they would not be able to begin harvesting until the end of the rainy season in April. Another problem is that even when more food assistance does arrive, it will be difficult to distribute if the population has dispersed. "The general health of the displaced is already poor," said one relief worker. "They are not going to get any stronger if they are forced to walk a hundred or so kilometres back to their villages, where there is no food." Lake Upemba, Katanga Province, DRC. 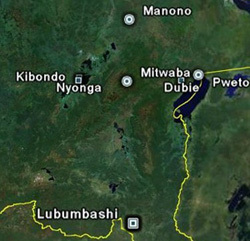 In late January, Gen Tshibumbu started moving all but one of his five battalions, west of the triangle towards Lake Upemba. His troops encountered strong resistance along the way, south of the town of Mitwaba. "Previously, it was the army that attacked the Mayi-Mayi, but now the Mayi-Mayi are attacking the army first," said an aid official in the area. On 16 January, he said, the Mayi-Mayi attacked the town of Kyubo, 160 km south of Mitwaba, and it was "completely wiped out." Further west of Mitwaba, on the eastern shore of Lake Upemba, the army was reportedly doing better. Displaced people on the lake said they began hearing several rounds of heavy weapons fire in early February. There were also reports that troops were moving down the eastern shore from the north, taking back towns and villages under Mayi-Mayi control. The Mayi-Mayi were blocked from fleeing south by a newly formed civil defence force called the "requins civils" or "civilian sharks". Tshibumbu, however, had not sent troops westwards from the eastern shore, and so the Mayi-Mayi started crossing the vast lake in canoes. The mirror-calm waters and lush islands and marshes of Lake Upemba are deceptively beautiful. The terrain is, in fact, utterly inhospitable - too wet to grow crops and plagued by mosquitoes and other insects. Walking in the marshes, from one displaced family's shack to another, is like walking on a mattress, with putrid mud and water swelling underneath. When the surface breaks, the muck comes up to one's knee. MSF said 15,000 people had fled to the area in the last three months, in addition to 20,000 who were displaced earlier. They came in search of safety from the Mayi-Mayi, but now the Mayi-Mayi fighters are themselves hiding in the marshes, ready to pounce. On 22 January, Mayi-Mayi simultaneously attacked two swampy islands, Itombe and Kinawa, where thousands of people had recently sought refuge. After looting whatever they could, the Mayi-Mayi forced some people to go with them, allegedly to be used as human shields. One girl who refused to leave with them was severely beaten. On 24 January, Mayi-Mayi crossed the whole lake for the first time through the marshes, to where Lake Upemba and the Congo River meet. They attacked and burned the village of Kibondo, which IRIN visited on 1 February. Douglas Nguidi, a nurse at the dispensary in Kibondo, said the attack started at 2 a.m. with heavy shooting. "The Mayi-Mayi said they wanted to kill the policeman in the village, but when they didn’t find him, they shot dead another man instead, as well as wounding a woman and child," Nguidi said. In response to the attack, MSF, which runs the only relief operation on the lake at the nearby town of Nyonga, decided to stop handing out plastic sheeting and other necessities. Roman Gitenet, MSF coordinator in Katanga, said the agency had done so because "the Mayi-Mayi had told the displaced that they were going to come back and take whatever MSF had given them." Mayi Mayi and soldiers dance together at Dubie, Katanga. On 3 February, IRIN went to the headquarters of the 6th military region at the provincial capital of Lubumbashi for a briefing by the deputy commander, Col Louis Ngizo Siatilo, a short, soft-spoken man in a neatly pressed uniform. Siatilo started with what, from his perspective, sounded like good news. "We hope that in two weeks, we will have concluded the whole operation," he said. When asked about the army’s response to Mayi-Mayi invading Lake Upemba, he said, "We have sent an advanced platoon [35 troops] and soon a whole company [125 troops] will follow. We will then begin to clean the whole park step by step." The colonel conceded that it would be difficult for so few soldiers to contain the Mayi-Mayi in such a huge, inaccessible area. "Indeed, the area is vast, and surrounding the Mayi-Mayi would require large amounts of troops, and the cost of such an operation would be too high," he said. He grew less optimistic. "Many of our commanders and soldiers don't have the necessary capacity," he said. The Mayi-Mayi are also well-armed and get some of their weapons from government troops. "We have deserters who sometimes take arms with them," he said. "Sometimes, the Mayi-Mayi attack the army and succeed in taking equipment." But worst of all, he said, certain leaders in the government were supporting the Mayi-Mayi. Siatilo maintained that politicians in President Joseph Kabila's inner circle were pulling the strings, using the mayhem to weaken Kabila. "The politicians use the situation to make themselves important," he said. "They tell the Mayi-Mayi, 'Look, the government doesn’t care about you. You have to take hostages et cetera to draw attention to your plight.' And they know Kabila will never destroy this area because then he will have no base." The colonel refused to name names, but a report by the International Crisis Group issued on 9 January, names several people, including Katanga's Governor Aime Ngoy Mukena and Maj-Gen John Numbi, the commander-in-chief of Congo's air force. Both are close relatives of Mayi-Mayi leaders, it said, adding that they "helped create and supply these militias" and "now seem unable or unwilling to dismantle them." A report on illegal arms trafficking issued by the United Nations Security Council in July 2004, also named Numbi as closely supervising "large quantities of arms and ammunition transiting through Lubumbashi airport [which mostly] arrived at night." Many international officials in the Congo said the army and the government are not serious about ending the conflict in Katanga. Although the UN Mission in the DRC (MONUC) has provided support in other provinces in northeast DR Congo, it has not offered its help in Katanga. Siatilo said MONUC lends its support in other regions because fighters there are often foreign rebels from neighbouring Uganda and Rwanda, and MONUC's priority is to stop them destabilising the region. However, MONUC officials said there were also other factors: "The government is telling us that it can handle this problem," said a UN official who did not wish to be identified. "For many reasons the government doesn’t want MONUC in Katanga." There is also debate over whether the Mayi-Mayi’s much-feared and legendary leader, Gedeon, actually exists. Mayi-Mayi fighters who recently surrendered to the army in Dubie, said he rarely appears in public. When he does, he always wears a mask. When Gedeon’s second-in-command met with UN officials in an attempt to start negotiations, he admitted that he had never actually seen the man he represents. But even if Gedeon does not exist, violence is spreading. On 5 February Ann Edgerton, head of the UN humanitarian office in Kalemi, said Mayi-Mayi groups recently attacked and burned villages around the gold-mining area of Etoya. Etoya is 100 km north of the Mitwaba-Pweto-Manono triangle, almost the opposition direction from Lake Upemba. "All the displaced people I spoke with said their villages were burned by Mayi-Mayi affiliated with Gedeon," she said. "Whether they were or not, we continue to witness more waves of displaced."